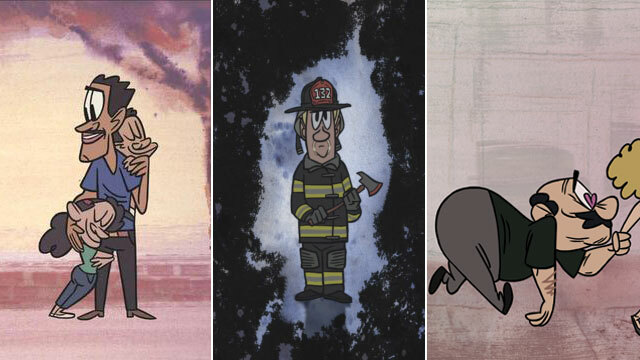 Public Television's StoryCorps oral history project selected three histories to be animated commemorating the 10th anniversary of the 9/11 attacks. We’ve mentioned StoryCorps a couple of times before on Facebook and Twitter. A project of US Public Television, producers send mobile recording vans around the country to preserve oral histories of normal Americans. Some of the best of these oral histories then get adapted by the talented team of art director Bill Wray and animators the Rausch Brothers into short animations; films that are equally valuable as stand-alone documentaries and as advertising for the larger StoryCorps project. Danny and Annie, their most famous animation to date, was a certifiable viral hit, seen my millions of online viewers. Now, in honor of the 10th anniversary of 9/11 we’re given three new animations that present the memories of those who lost loved ones that tragic day. Maintaining the same vintage cartoony-style of the series, these films carry an added emotional heft due to the tragedy inherent in their stories. 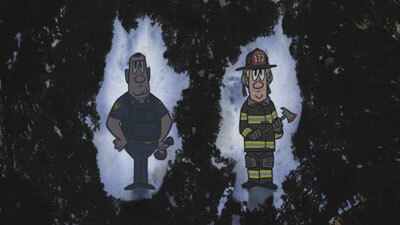 They are simple works, befitting the everyday lives that were nonetheless changed forever nearly 10 years ago. While the whole point of the larger project is to highlight and preserve the the fact that amazing narratives are all around us, it seems especially important for huge cultural-defining events like 9/11. The geo-political scope becomes, at least for me, too much, transforming it in my mind into some sort of abstraction. The reason 9/11 is a tragedy is that it happened to people not unlike you or me, and these films do an amazing job of crystallizing that central truth. Below are the three films, click the image to view, and consider donating to the project below as well. Storycorps has made it a stated goal to record one history for every person killed in the attacks.